I written a number of blogs pertaining to the mindset of retailers when they layout their stores and assign locations to departments, categories, displays. Certainly retailers use their instincts, logistical logic, and past successes in their decision making process. Some of the more progressive retailers might even think about how ergonomic or shopper friendly their designs might be and make adjustments accordingly. Once operational, shoppers flock in, make their way through the aisles, visit departments and ultimately ‘learn’ how to shop that particular so they can optimize their time spent shopping. But what most retailers miss is the valuable information is available to them just by looking at the shopper’s footprints they leave behind. Having studied shopper traffic flow for more than 25 years now, I first became intrigued by the notion that some areas of even the busiest of stores are nearly devoid of shoppers. 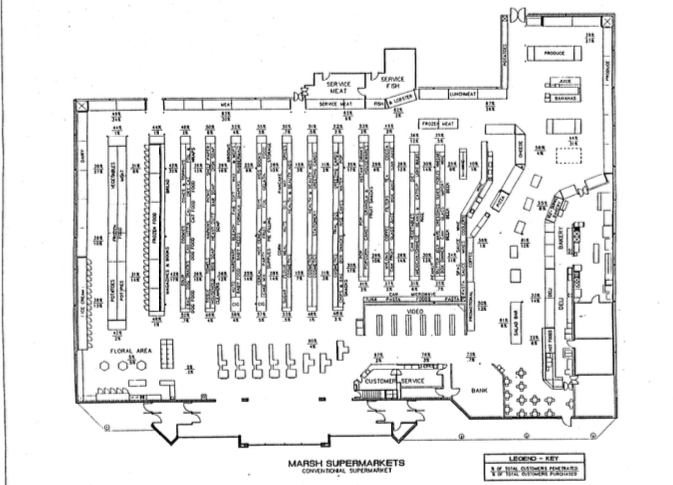 My involvement in the 1993 Marsh Super Study was one of the first pure efforts that I had seen to date that gave serious thought to measuring shopper presence in the store, down the aisle, around departments and at each specific display. I discovered then and since, that there are a variety of reasons for “cold” spots in the store, not the least of which is the products themselves that are offered in these areas are not frequently purchased items. But other factors, human, habitual factors also play a role in the disparity of shopper presence in any store. Fast forward 25 years and technology and techniques have enable shopper tracking to become a ‘potential mainstream’ tool in the retailer’s arsenal of operation and merchandising resources. But, aside only a few exceptions, that has not happened. For the most part, retailers continue to use their wits, experience and logistic requirements to plan the layouts of stores and the location of products. The more progressive retailers I have talked to, are indeed familiar with the shopper tracking and some have actually conducted such research in quest of better store design and merchandising practices. Unfortunately, more than a few I know have not been impressed with the results of recommended adjustments these technology resources have provided post mapping. Over the years, having implemented such research and written dozens of recommendations, I have come to the conclusion that there are few key factors that must be considered before implementing changes in the store as a result of shopper tracking. In my view, one of the major reasons for the disconnect between applying shopper tracking results to the store layout and merchandising process is simply not thinking holistically about how shoppers in 2018 use food, drug, and mass stores. Making significant changes to product locations or store layouts, despite the projections of sales improvement, are disruptions to shoppers. These customers have ‘learned’ to shop the store as it is, so if you make a change, it better be beneficial to the shopper. Changes must be subtle and shopper-centric, that is they make sense to the shopper. Retailers are still designing and merchandising their stores for stock up shopping. Trends are clear, even among mass merchants, transaction sizes (units in the basket) are getting smaller as on-line and specialty retailers have invaded the retailer’s share of customer. Being mindful of providing frequent-selling items more efficiently to shoppers, particularly in large foot print stores, must be part of the plan. Hoping that shoppers will invest an hour or more of their time shopping in any store is inconsistent with shopper trends and their changing expectations. Bricks and Mortar store retailers should measure and manage the amount of time their shoppers must spend in their stores. Any changes made to the layout or the location of products should produce more efficiency for their shoppers. (Dollars/Minute Shopped) should be benchmarked and changes should increase the dollars spent for every minute they shopper gives you. Measuring shopper exposure to departments and items is superior than just counting customers. Observational techniques exist that allow for store traffic maps to reflect actual visual contact shoppes have with areas and items in the store as opposed to simply counting passing shoppers. When making layout or product location changes, measuring the improvement of exposure and the ensuing sale becomes a key metric to hone in on subtle changes that make impact to top line sales. Shopper tracking, even though it has been around for decades, is really still in its infancy. The key to successfully deploying shopper tracking tools is first understanding the mindset and the established habits of the shoppers in the store. Disruption is bad. Subtle enhancements to their journey is good. Moreover, if large foot print stores are to survive into the next decade, shoppers will expect them to make their trips more efficient, more pleasurable and less time consuming. Speaking of time, the clock is ticking.